Born powerless in a superhuman society, Izuku Midoriya is often bullied and shrugged off by his peers. His lack of powers, or “quirks,” won’t stop him from his ultimate dream—to become a Hero. After a fateful meeting with his childhood idol and the #1 hero, All Might, Izuku’s life is changed forever and he sets off to make his dreams a reality. This officially-licensed My Hero Academia figurine features Izuku Midoriya, also known as Deku, in his tri-color U.A. gym suit. This non-articulated figurine includes a removable base. Always ready to lend a hand, Deku would make a great addition to any MHA collection! 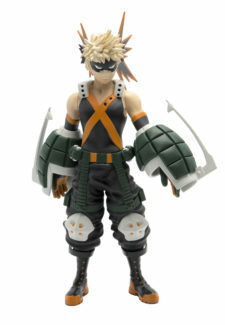 With his spiky hair and grenadier bracers, this Bakugo Katsuki figurine by ABYstyle captures every bit of “Kachaan’s” charm. The non-articulated figure includes a removable base and would make any UA fan proud to have it as part of their My Hero Academia collection!